Something dropped on your head one day as you left for work. You cringed and cautiously moved your hand over where it landed to see what it was. You pray and hope that it's not the white sticky smelly stuff. It turns out to be a piece of a shingle. What’s a shingle you say? It's the roof covering that’s made out of asphalt. It's perhaps the most widely used material and design to protect your roof from the wind, hail, and rain. If you want a quick check of how well your roof is doing without having to climb up a ladder and confronting your fear of heights, do this next tie it rains. Leave fine sieve in the drain where the rainwater from your gutters pours in. 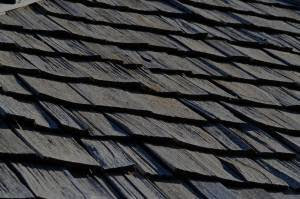 if you can see an almost black powder or even bits of shingles in the sieve when the rain has stopped, chances are that your roof has come to the end of its life expectancy. If that’s still not enough to persuade you, do these things. 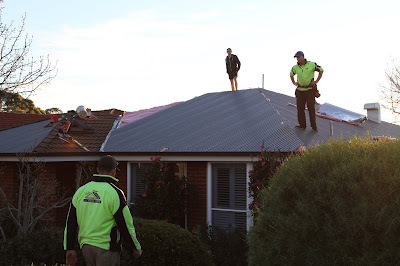 To find out whether or not the design integrity of your roof is kaput, next time it rains go outside and observe the flow and drop of the rainwater on your roof. Roofs are not purely designed to look aesthetically pleasing therefore to add to the value of the home. They have to direct rainwater in certain directions so the water doesn’t pool or get trapped behind tiles or shingles. Watching a stream of water jump off the roof and splatter the water on the ground is a clear indication of irregular flow. Rainwater should not drop off your roof and instead get collected by the guttering. So what could be causing this? A number of things such as debris of broken pieces of tile or shingle blocking the stream channels. It could be moss has grown in the cracks of tiles after water and bacteria have become trapped. It may be bumps in the underside of the roof caused by an air pocket that’s caused by a fracture in the roof structure. If water or wind damage creeps into your home, it can cost you a lot to repair the inside even before you’ve got to work on the outside. So don’t cause yourself a double headache and get to the roof before it dies. Now is the perfect season to replace the roof because it's less likely to rain in the spring. Next comes the summer which gives the roof time to settle in and all the fitting to become harder in the hot sun. some companies do roof replacement specials during the spring such as $700 off any roof that costs over $7000. Since the average cost of a new roof maybe around £8-9000, that’s something you may want to take advantage of. Utilizing SureNail technology, the new roof would withstand hurricane winds of up to 130 mph. A lifetime warranty can be guaranteed for a new leak-free roof thanks to innovations in craftsmanship. Roofs normally reach their life expectancy after 30 or so years. In the last few years, they will show clear signs of deterioration which leads to other faults around the home. Irregular rainwater flow is just the beginning. If the roof can’t control water, chances are it won’t put up much of a fight against winds either.